Performers include: Brad Garrett, Joely Fisher, Kat Foster, Eddie Kaye Thomas, Timm Sharp, J.B. Smoove, Nick Bakay, Lindsey Broad, Anthony Anderson, Kathleen Rose Perkins, Susan Yeagley, Krysten Ritter, Kevin Nealon, Martin Mull, Kate Micucci, Kym Whitley, and Laura Clery. 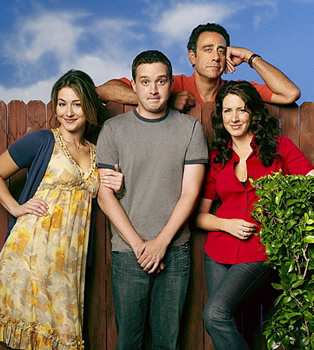 Blissfully happy newlyweds Jeff and Steph Woodcock (Eddie Kaye Thomas and Kat Foster) move next door to jaded Eddie and Joy Stark (Brad Garrett and Joely Fisher) who have been married for 23 years and have a college-age daughter. The newlyweds get a surprising look at what their future might be while the Starks see what they’ve lost. Eventually, the Woodcocks move away and Eddie befriends misfit divorce Kenny (J.B. Smoove) through the local Big Brother program. Kenny ends up getting kicked out of his apartment and Eddie invites him to stay with him and Joy at their house, much to Joy’s chagrin. Later, the Starks’ daughter, Allison (Krysten Ritter, then Laura Clery, Lindsey Broad, and Kate Micucci) moves back home and lives with her slacker boyfriend/husband Doug Von Stuessen (Timm Sharp) in a trailer in their backyard. I loved this show. I cant believe it was cancelled after only a few seasons. There should be at least a spin off( for example Frasier). It had a great cast of actors. Definately the best sitcom I’ve seen so far. The reason I feel this show did not make it is they could not decide how to use the supporting characters. Every year they changes them and each change was worse than the last. They should have stuck with the he first couple living next door, they had a lot of potential for story lines. The writers just did not seem to know how to use them. To bad because the the Maim characters were great until they got too lovely and mushy the final season. I blame the writers on this one. The best show ever !! Nothing comes closed to it. I’m not sure when it aired originally but I never miss the reruns. It is funny and entertaining; definitely not the actors that caused it’s demise. I beleive it would have done better on another network?? I agree with you. the only shows I enjoy on Fox now are Raising Hope, The Simpsons, and that is it. It used to be the number one network in my mind when I would talk about my favorite shows but now….nope. They make new shows and throw them away faster than you have time to sit down for one episode of anything on there. I really loved the show…Funny storyline! They seemed to change the people who played different parts…but I thought it was really FUNNY!